Lamb Mannerheim (Julianne Hough) grew up in a very small, very religious, very conservative town. After an accident left her badly burned, she goes to church to talk about how the grace of God helped her heal. Instead of the inspirational speech everyone was expecting, Lamb goes on a rant, telling everyone in the church that God does not exist. After shaming her parents (Nick Offerman and Holly Hunter), Lamb takes her settlement money and heads to Las Vegas. She intends to live life to its fullest. When Lamb arrives in Vegas, she immediately starts crossing items off her “sin” To Do list. This includes trying alcohol for the first time. At one of the bars, she meets Loray (Octavia Spencer), a singer, and William (Russell Brand), a bartender. The trio heads out on the strip to help Lamb with her list. During their night of debauchery, Lamb realizes that living the life of sin isn’t as glamorous as she had expected. After a chance encounter with an “angel,” Lamb discovers a new path for her life. Julianne Hough seems to have found a niche for herself. One only has to watch her characters in Rock of Ages and the Footloose remake to discover what type of character she wants to play in all her movies. That is, the innocent girl from the small town who finds herself in the dark underbelly of the big city. Paradise fits in nicely with how she defines herself as an actress. Perhaps it’s an echo of how she sees herself in Hollywood. Russell Brand is charming as the nice-guy bartender. He’s not a lech, just a guy trying to help a poor girl experience life. His wit isn’t over the top, but not underplayed to the point he is wasted. Russell is definitely the highlight of the movie. Octavia Spencer, Nick Offerman, and Holly Hunter are a little underused. None of them really stand out in the movie, despite all their potential. Paradise starts off with the best of intentions. It is your typical fish out of water story, with Lamb trying too hard to rebel. 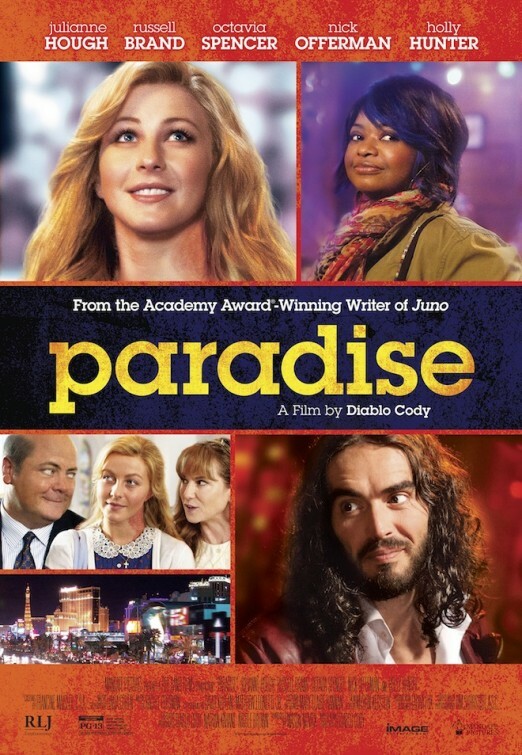 The jokes, mostly fired off by Russell Brand, work for the movie. I found myself laughing more than I expected for a Julianne Hough movie. Once Lamb has her epiphany, the movie takes a sharp downturn. The jokes completely stop. The film takes a much more somber note. And then I lost interest. The whole film is a bit unbalanced. Lamb goes from giving everything she used to believe, to giving up everything she wanted to believe. She doesn’t really change as a person. You leave with the same Lamb you started with, only she has a slightly altered outlook on life. Julianne Hough may have found her niche as an actress, but she has yet to find her groove. The result is a stilted, uneven film that doesn’t know how to resolve itself. I would recommend skipping this one. Paradise isn’t all it’s cracked up to be.